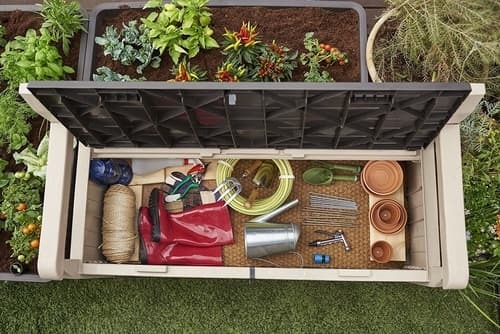 This is our detailed review of the Keter Eden Bench Outdoor Storage Box. 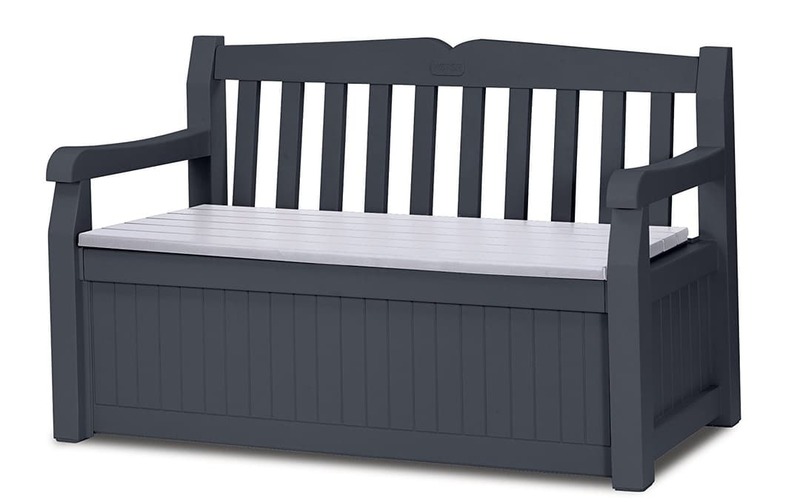 As you can see from the image below this is designed as a bench that you can sit on, and underneath the seat, you can store many gardening or other types of items. It has maintained this rating from thousands of online buyers. Many of those buyers have taken the time to leave a review. Here at this website we pull all those reviews together, and then summarise those. That should hopefully save you some time having to read through all of those individual reviews yourself. Just below you can see an image of this bench/storage solution. As you can see this bench looks great, and the good news is that this is easy to keep clean. It is made from a hard plastic which is easy to wipe. If you like your comfort you will have to buy a cushion or cushions to make the seat a bit more comfortable. This bench will comfortably hold two adults. You can buy this one in the beige colour shown in the image above, or you ca also buy it in a grey colour shown below. As part of our research we discovered that you can buy this online and at some gardening stores with a recommended retail price of £99.99. We also know it gets good online buyer ratings of 80%. Search around as you can usually find it slightly cheaper online, and you can get it delivered to your door. However we now want to have a closer look at what it has to offer in terms of features and storage. In summary this shed is made from hard plastic panels with a wood effect look. It has a 265 litre capacity so able to hold quite a lot, though clearly not large items. It is weather-resistant and virtually maintenance and fade-free. It has lockable positions that complete the unit. Below you can find a couple of images of this Keter Eden bench. Please click on each to see a bigger version. We found this good review on YouTube, and we think it does an excellent job of explaining exactly how the benefits of owning this bench and storage combination might be a good choice for your home. As you can see the average buyer rating for this Eden bench storage is a pretty solid 80%. It has maintained that high rating for quite a few years. When I checked all the online reviews, I discovered that around 57% of those buyers rated this one very highly, and in essence gave this shed the full 5 star treatment. Around 11% of online buyers said that this product was poor and that they didn't like it or rate it that highly. I shall certainly check why that was the case and have shown that just below, in the what the buyers didn't like section. Clearly from the buyer reviews, it is clear to see that overall, they seem to like the product. We think that at the £99 price point this is good enough value for money, but we recommend shopping around as you can find this one cheaper than paying the full RRP. The 11% of complaints is higher than we like to see, and those are a mixture of difficult assembly, and buyers struggling to get this to click together. That sounds like they have got a poor unit from the factory, and personally I would be returning it, if that happened to me. 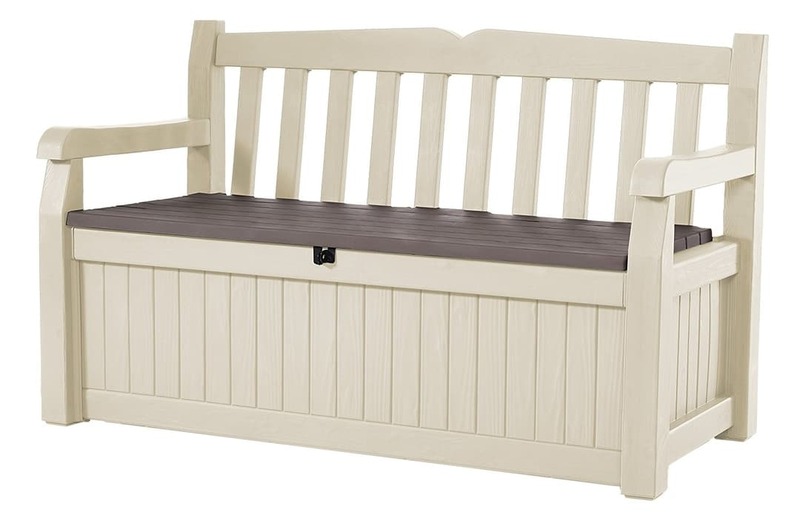 Overall buyers believe this bench to be good value for money, and it is certainly handy for storing some items. It can hold two adults easily and I do like the fact that it is easy to keep clean. As I mentioned earlier you can buy the cushion for this, and we have shown that to the left. I have shown here the blue pin striped style but it is available in a wide range of colours. It is part of the Gardenista Gold Collection in case you are looking for it in another store. It measures 128 x 50 cm and is 5 cm thick, so enough to allow you to have a comfortable seat. It might also be worthwhile investing in a cover which costs around £5-10. I would strongly recommend having 2 people doing it, as it makes the entire assembly process a great deal easier. The instructions are easy enough to follow. Just be aware though that if the pieces don't easily click together, then get in touch with the buyer and get it replaced.